Nestled in amongst beautiful rolling hills you find a small micro-brewery with a revolutionary spirit. The Brewery was established with the intention of supporting the local economy and to use only the finest natural ingredients. This, for those of you who know me, could easily describe Stroud Brewery, my former employer. 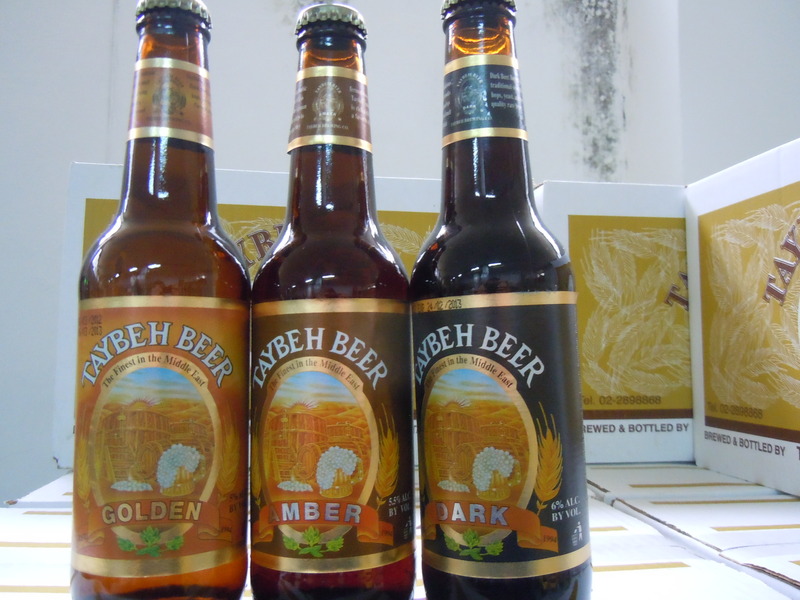 Today however, I am describing the only micro-brewery in Palestine – Taybeh Brewery. It is based in the village of Taybeh (aptly meaning ‘delicious’) just outside of Ramallah, the de facto administrative capital of the West Bank. This may seem an unusual place to stumble across a brewery. When you think of a micro-brewery, Palestine is not the first place to spring to mind. To suggest that brewing might not ‘belong’ in the middle-east is an idea that head brewer Nadim Khoury has evidently heard one too many times; It is near to impossible to leave the brewery without picking up the fact that beer was first brewed in the Middle-East up to 5,000 years ago. Nadim is a man who is hard to dislike – when he strides into his brewery you can feel his passion, warmth and enthusiasm rush towards you. His big bushy moustache has no chance of hiding his beaming smile as he asks you if you would like a beer – you just know that he wouldn’t mind one himself. Nadim is clearly very proud of his brewery and so he should be. The story he has to tell is truly remarkable. In 1994 just after the signing of the Oslo Accords, Nadim and his brother David invested some 1.2 million US Dollars into the brewery (all the equipment had to be specially imported). Nadim started this brewery with no more than some home-brew experience. 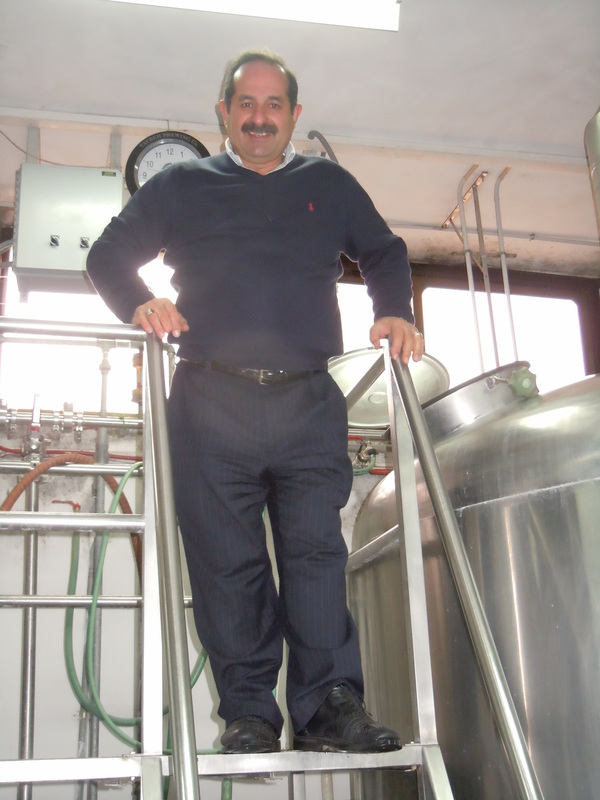 Nadim set up the brewery in his home village of Taybeh determined to support the ‘new’ emerging Palestinian economy. He described people’s attitudes at the time by saying, “people thought I was crazy”. I smiled and he cackled a crazy man’s laugh and started to walk away muttering, “really crazy”. There are a few very good reasons why anyone other than Nadim might think twice before setting up a brewery in Palestine. Indeed, it has to be noted that Nadim is currently the only person to have taken on the task (with considerable success I might add). He has had to overcome large cultural and religious issues as well as the small issue of living and working under military occupation. I was eager to find out the source of his success. 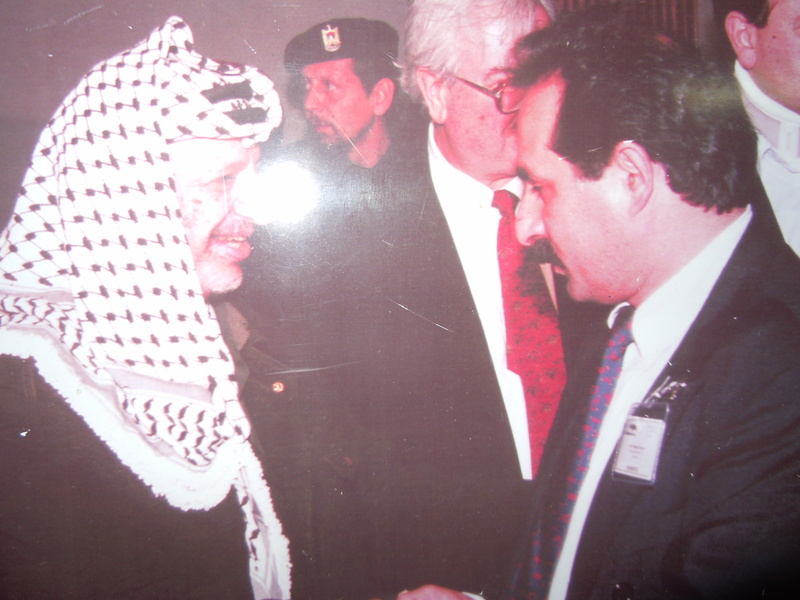 “It was crucial to get Arafat on board with our vision” Nadim says gleaming at a picture of him shaking hands with Arafat. “With Arafat on board I knew that I could make this work”. The subtext that is never spoken here is clear – with the endorsement of Arafat, overly zealous locals who might have otherwise taken an objection to a brewery opening remained quiet. 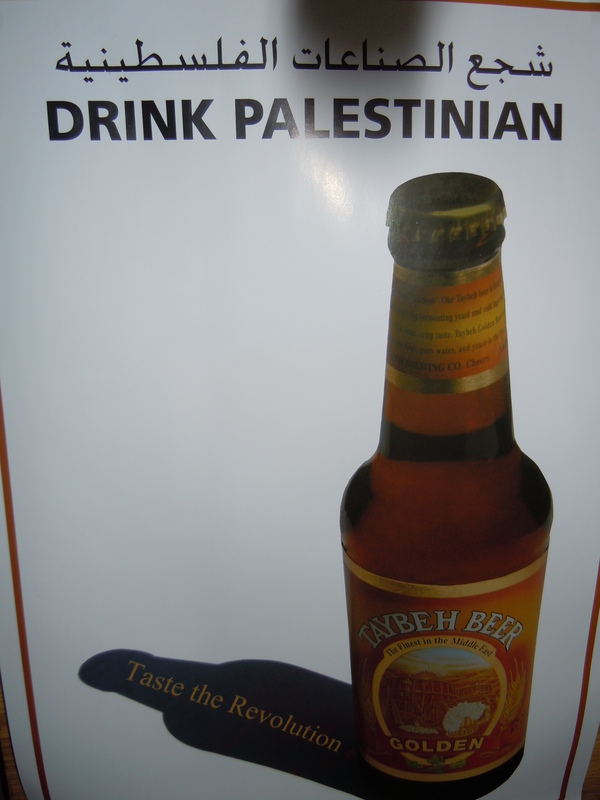 Today, the majority of people who drink Taybeh beer are Muslims – not Christians, secularists or Jews. I suspect that’s one lingering stereotype that Nadim is happy to have broken. Taybeh however is a Christian village. I asked Nadim what relations are like with his immediate neighbouring ‘Muslim villages’ and he responded positively highlighting the importance of the brewery to all of the surrounding local economy. “In the 2 days that people from all over the world come here for our ‘Oktoberfest’ local traders sell more of their produce than in all of the rest of year”. Quite a claim – I can see why the locals might have a soft spot for the brewery. 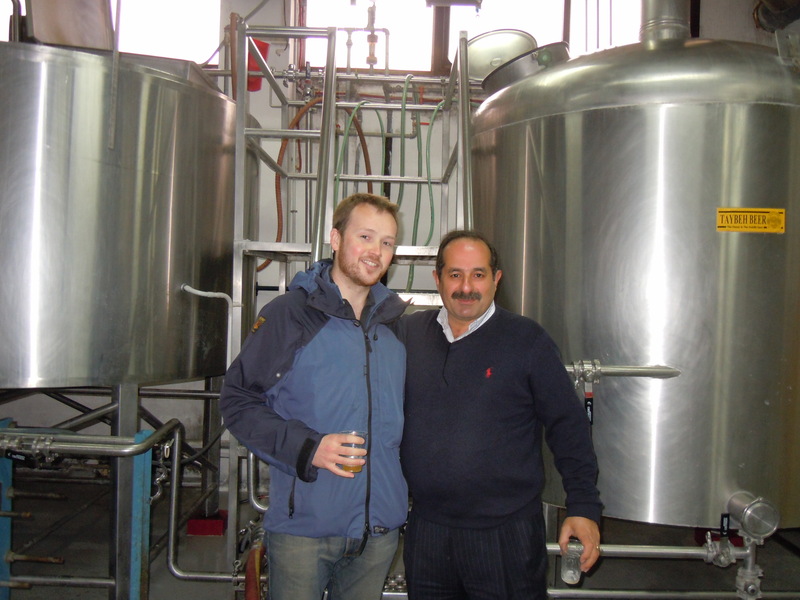 The brewery attracts a wide spread of support from the significant Palestinian Christian population right through to the droves of internationals that make their secular pilgrimage to this site. Israeli activists have also been known to show their support of the brewery. Life has not always been easy for Nadim or the brewery though. On a number of occasions the brewery has been on the brink of closure due to a terrible mix of dropping demand (during the second intifada for example) and continued restrictions on movement of people and produce (he has to drive the beer for hours to a checkpoint in the south of the West Bank to ‘export’ his beer to Israel). 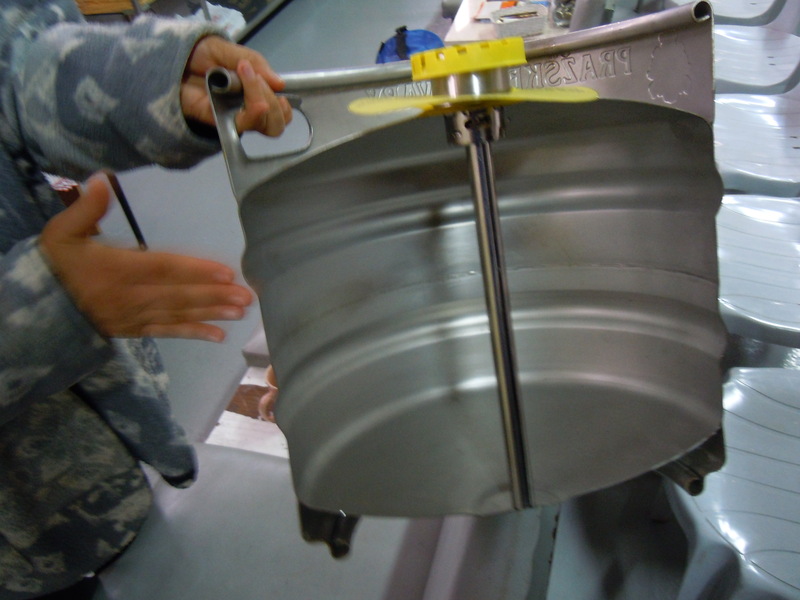 At this point he shows me a cask that he has cut in half – he uses it to illustrate to IDF soldiers what the inside of a cask looks like. Now, whenever his beer passes a checkpoint it has to be weighed (more that 3 kilograms either way and it does not get pass). I don’t think any other brewery in the world faces these sorts of challenges. As if this story is not remarkable enough, another twist to the tale walks through the door – Nadim’s daughter and now the first ever female Palestinian brewer. She is articulate and shares her father’s passion for brewing. I talk with her about the beer industry in the UK and how it is so dominated by men and ask what challenges she faces here in the West Bank. She answers sincerely saying “some of the older customers prefer to deal with my father but most have got used to it by now”. Another stereotype being chipped away at? As we leave (with a handful of bottles) I over hear the rest of family (all who have various roles within the business) chatting. One of them is being interviewed by a reporter about a film she produced highlighting the issue of domestic violence in Palestine. Nothing surprises me now. This brewery is breaking down boundaries built up by prejudice. At the same time it is building and laying the foundations for the future. At the heart of whatever the future holds for this region there has to be a stable economy. Taybeh Brewery is busy laying the foundations for this future. As I wait for a taxi to take me back to the reality of the rest of the occupied territories, I consider how, for me at least, I cannot think of more appropriate way support local people than to raise a glass of Taybeh beer. When people ask what you can do help resist the occupation and help people survive, I reckon this has to be one of the easier asks. Click here and have a beer – cheers! Steve, Absolutely brilliant, glad to hear that the joy/love of both making and drinking beer has survived against all the odds. Love the ad immediately following the blog on improving your brain, always felt that a decent brew was a brain enhanser.